Enter the The Family Tree Historical Newspapers Guide Giveaway at Genealogy Bargains! 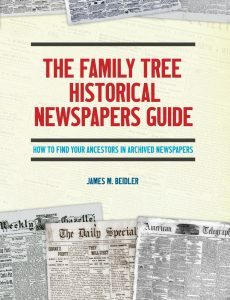 This week we are celebrating the publication of a new book by James M. Beidler via Family Tree Magazine, The Family Tree Historical Newspapers Guide. Enter The Family Tree Historical Newspaper Guide Contest this week and you could win a FREE copy of this amazing e-book. We’ll select three (3) winners and each winner will receive the e-book version. IMPORTANT: You get more entries if you follow us and like our Facebook page, and check out the deals at DNA Bargains. See details below! The More You Share . . .
Don’t forget that this is a VIRAL contest, meaning the more you share your “lucky link” the more “tickets” you receive. Your lucky link is the URL that appears in your web browser once you’ve entered – it will have a unique number at the end. Share on Facebook, Twitter, Pinterest and send an email to friends asking them to enter. Also make sure you like the Genealogy Bargains Facebook page and check out the latest deals at Genealogy Bargains visit to earn 3 entries for each action. You will see these links on the contest confirmation page. We’ve held recent contests where more than one person had over 500 entries! This is a $25.99 value and you could win if you enter by 11:50 pm CST on Tuesday 6 February 2018. Click HERE to enter!